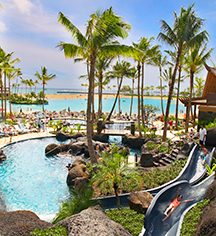 Hilton Hawaiian Village, a member of Historic Hotels Worldwide since 2015, dates back to 1957. 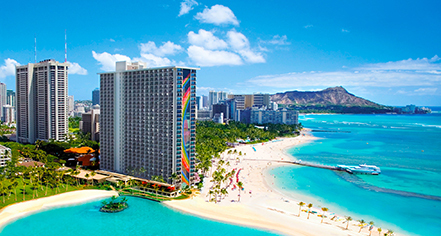 The Hilton Hawaiian Village® Waikiki Beach Resort is the setting of Elvis Presley’s famed movie, “Blue Hawaii” (1961). Hotel/Resort Fees & Taxes: A Daily Resort Charge of $35 (plus tax) is assessed per room, per night (valued at $128). Please note that our Daily Resort Charge is assessed at check-in. This $35 daily charge may not always be added to your final online transaction for reservations made through this website or through online travel websites or travel agencies. Charge includes: WiFi, PlayStation®3, Hawaiian Cultural Activities, Movies, Discounts, Exercise classes, and Personal Postcard. Taxes: 13.967 sales and occupancy tax.